How Do You Solve A Problem Like Stainless Steel? Home » Nikel Reviews » How Do You Solve A Problem Like Stainless Steel? I love my stainless steel appliances, love, love, love them. They look so pretty, all matchey-matchey, shiney and sparkly. Don't know why I could't get a straight picture... this was my third attempt! With all that good stuff being said, I have a pet peeve. This pet peeve really only pertains to my fridge. Before I bash my fridge, I should make it clear that this fridge does many things well. It keeps all my food cold, very important. It makes me ice. It freezes stuff, and it looks good doing it. My problem - it is not magnetized. This made it extremely difficult to make a magnet stick (no matter how hard I tried!). I needed to find a solution to this. I had things that I wanted to attach to my fridge: photo's of our nieces and nephews, birth announcements, and other random things. 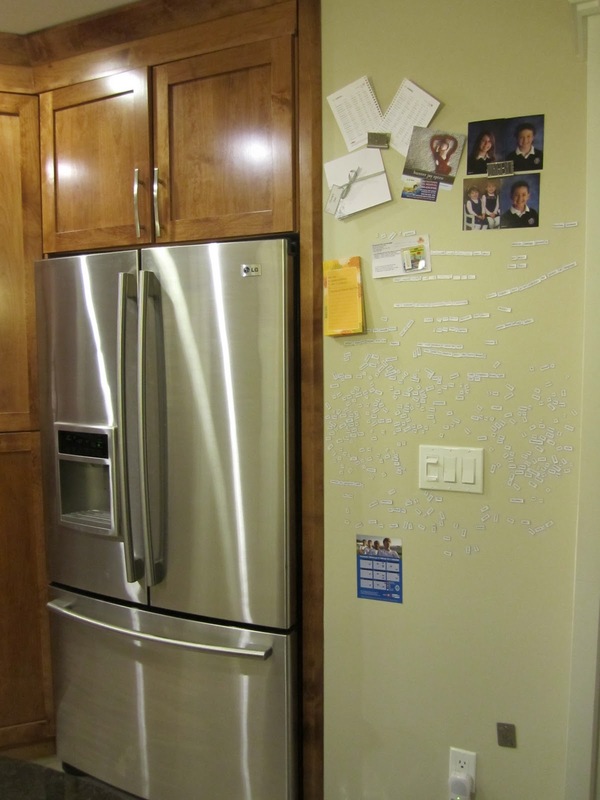 There is a small wall that is right next to our fridge that I wanted to turn into a magnet wall. After much scouring of the internet, I discovered that Home Depot carried a magnetic paint. I bought said magnetic paint and left it in the capable hands of my husband, the professional painter. The magnetic 'paint' is really a primer. The can suggests using two to three coats, the more coats = the more magnetic the wall will be. My husband found that that didn't cut it. He did about five or six coats. After finishing up with the magnetic primer, he topped it off with three coats of our kitchen wall color. This also gave us the opportunity to get a magnetic poetry kit. 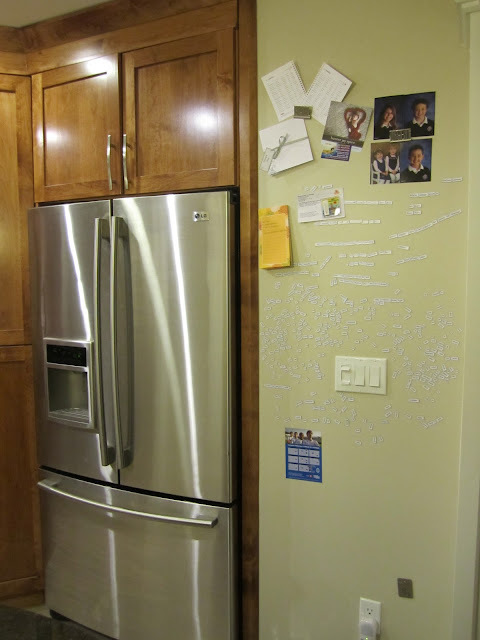 Oh man, the things that can be created with a simple magnetic poetry kit. I absolutely love it when a problem is solved. Especially when it is solved so creatively.